Around 20% of energy used by Environment House will come from solar panels. Government is set to spend around R8 billion over 27 years to run its new headquarters for the Department of Environmental Affairs (DEA), which recently unveiled its new green building in Pretoria. The building - dubbed Environment House - took two years to build, at a cost of R653 million, according to the DEA, which says its previous office "no longer met the fundamental needs of the staff and was not a proper reflection of what the department represents". Around 20% of the building's energy will be generated from solar panels and it will also use rainwater for its gardens and restrooms, resulting in a 30% reduction in municipal water use compared to buildings of a similar size. Speaking at the building's unveiling, president Jacob Zuma said: "SA has relatively high emissions for a developing country, and we should make the most of every opportunity to change this trajectory, hence we have since developed the National Climate Change Response Policy. "With the opening of this building, we are showing a bold commitment to lower emissions as well as our commitment to the green economy". As SA's power grid came under strain earlier this year, with power utility Eskom announcing several load-shedding schedules, government wants to increase reliance on renewable energy sources to ease the pressure. 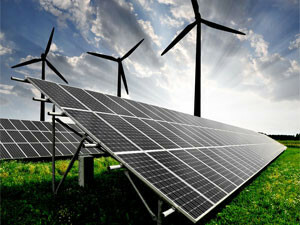 The Renewable Energy Independent Power Producer Procurement Programme will take advantage of alternative means of generating electricity and aims to tap into the resources of independent power producers to generate around 3 725MW for the national grid, using solar, wind and hydro electricity. The private sector has also jumped on the bandwagon, with Cape Town's Black River office park being one of several businesses installing rooftop solar panels to ease electricity costs. Excess power produced by the company feeds back into the City of Cape Town's energy grid. The 74 000 square meter facility uses roof-mounted solar panels and sells some of the power generated to the city at around 49.72c per kilowatt.